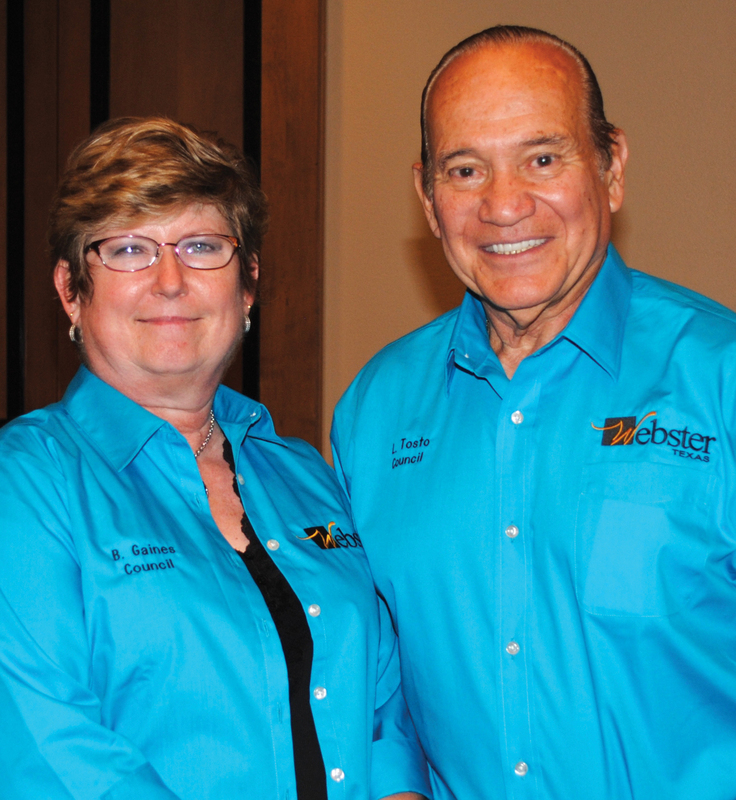 Webster was represented at the BAHEP Legislative Update by Councilors Beverly Gaines and Larry Tosto, who both wore their Webster shirts. THE BAY AREA was in for quite a treat this summer with eight state senators and representatives providing an update on the 84th legislative session they recently concluded. 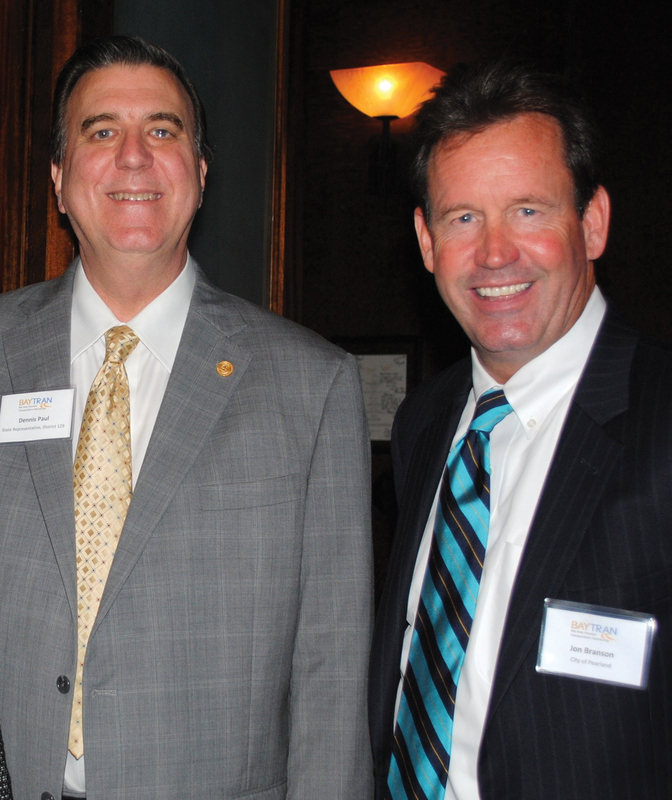 As the Bay Area Houston Economic Partnership’s Political Protocol Committee was making arrangements for the event, members decided to invite all our area elected officials and honor them at a reception before the update. Turned out to be quite an event with elected officials everywhere you looked. Several Bay Area mayors mingled with the crowd including Mark Denman of Nassau Bay, Tim Paulissen of League City, Glenn Royal of Seabrook, Carl Joiner of Kemah, Donna Rogers of Webster, Johnny Isbell of Pasadena, Michel Bechtel of Morgan’s Point and Jon Keeney of Taylor Lake Village. 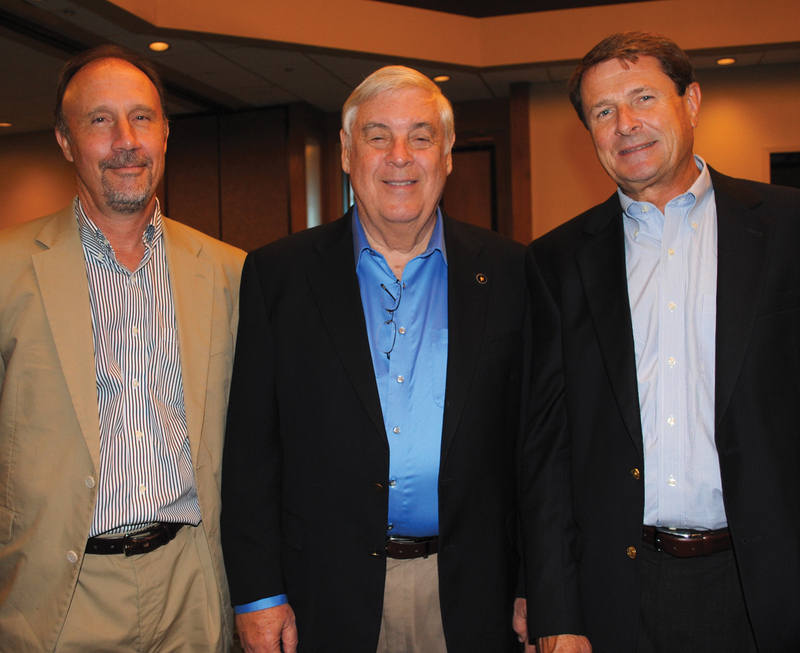 Joining Taylor Lake Village Mayor Jon Keeney, center, for the BAHEP reception and Legislative Update were Councilmen Bob Davee, left, and Doug Shows. Taylor Lake Village, Robin Collins and Wayne Rast of Kemah, Geri Bentley and Nick Long of League City, Craig Bland of Morgan’s Point, Pat Van Houte and Jeff Wagner of Pasadena, Mike Giangrosso and Robert Llorente of Seabrook and Billy Enochs, John Scott and Carl Gustafson of Friendswood. Clear Lake Shores Councilwoman Jan Bailey, right, chats with Webster Councilwoman Andrea Wilson after the BAHEP Legislative Update at South Shore Harbour Resort. Plus, Galveston County Judge Mark Henry and Commissioners Ken Clark and Ryan Dennard, Judge Holly Williamson, Clear Creek ISD Trustee Ann Hammond, Harris County Tax Collector Mike Sullivan and a number of representatives of officials who were unable to attend. All got to talk with the eight legislators – State Sens. Larry Taylor and Sylvia Garcia, plus State Reps. Wayne Smith, Wayne Faircloth, Ed Thompson, Dr. Greg Bonnen, Gilbert Pena and Dennis Paul, who explained their work in Austin and what they did and didn’t accomplish. BAYTRAN had quite a turnout for its luncheon featuring Lt. Gen. Joe Weber, the executive director of the Texas Department of Transportation. Several officials and state legislators were in the mix including State Reps. Dennis Paul, Ed Thompson and Wayne Faircloth, Mayors Tim Paulissen of League City, Louis Rigby of La Porte and Glenn Royal of Seabrook, Kemah City Administrator Rick Beverlin and Galveston County Commissioner Ken Clark. Pearland Deputy City Manager Jon Branson joined BayTran President Barbara Koslov in welcoming the crowd, all of whom were no doubt anxious to hear General Weber – especially those interested in the fate of Highway 146. Pearland Deputy City Manager and BayTran Chairman Jon Branson, right, welcomes State Rep. Dennis Paul to the luncheon at Cullen’s Upscale Grille. 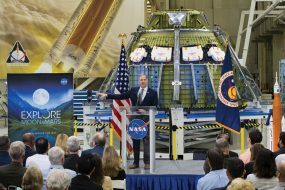 Others you might have spotted were Port of Houston Executive Director Roger Guenther, former Seabrook Councilman Kim Morrell and San Jacinto College Vice Chancellor Teri Crawford. 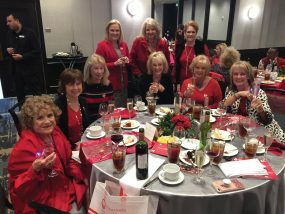 “GLAMOUR & GLITZ – Vegas Style” will be the theme for this year’s Clear Lake Area Panhellenic Fashion Show fundraiser, scheduled for Friday, Nov. 6, at South Shore Harbour Resort in League City. 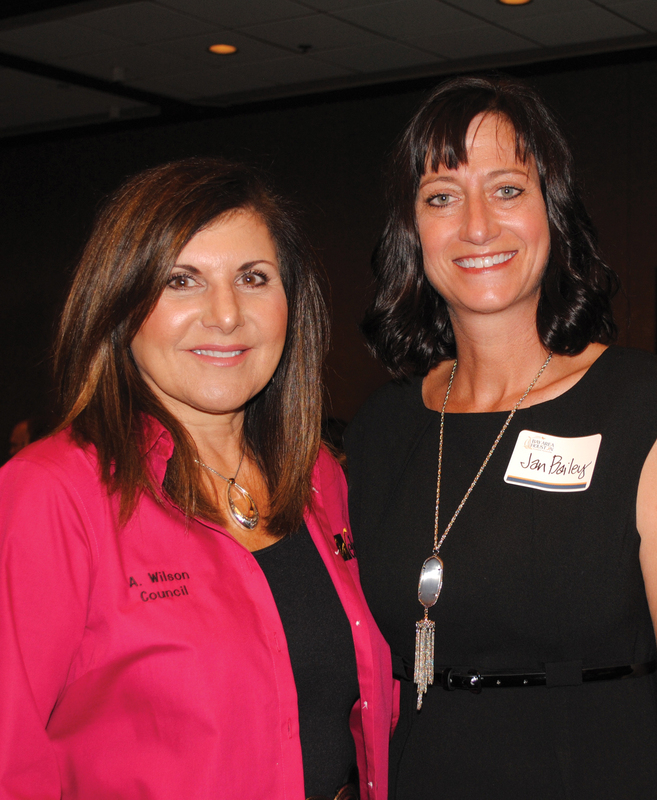 Ellen King is this year’s chairman of the event, with Karen Weber as co-chairman. 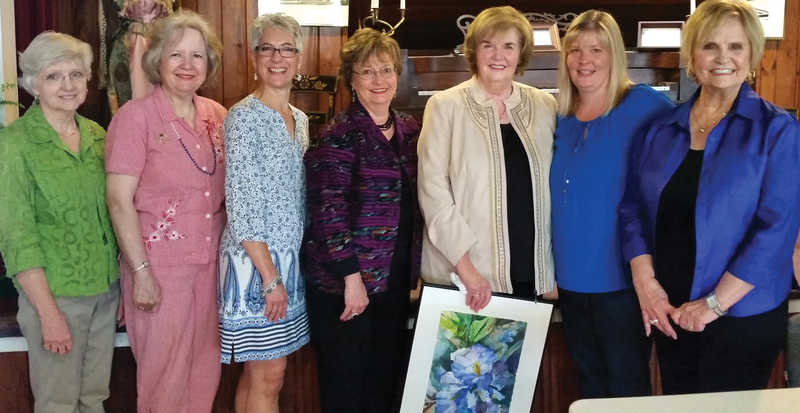 All proceeds from this event go to the Crawford-Zbanek Scholarship Foundation of the Clear Lake Area Panhellenic Association. This foundation awards college scholarships to area women who are pursuing a college education in Texas. Since 1967 more than $480,000 has been awarded in scholarships to young women representing Clear Creek ISD and surrounding school districts. Another philanthropic endeavor of the foundation is to sponsor girls from local high schools to attend Girl’s State in Austin, where young Texas women learn responsible citizenship and love for God and country. Meanwhile, Karen suggests we save the date. For more information on Panhellenic, visit its website, www.clearlakepanhel.org.